Before geologist and oceanographer, Marie Tharp, proved them wrong, most scientists believed the ocean’s floor was a smooth, flat, unimpressive expanse. But in 1952, Tharp, a brilliant geologist who had been relocated to a cramped basement office in New York City, because of the superstition that women bring bad luck at sea, she was not allowed to do field research, deciphered scans of the ocean floor and was the first person to map the Mid-Atlantic Ridge. Her discovery helped give credence to the theory of continental drift via plate tectonics, and ushered in a new way of thinking about the movement of earth’s land masses. Even as a young child, Marie Tharp was encourage to learn and explore. She was born in Ypsilanti, Michigan, on July 30, 1920. Her father, William Tharp, worked for the U.S. Department of Agriculture making soil classification maps. Her mother, Bertha, taught Latin and German. Marie Tharp enrolled in the University of Ohio in 1939, just as the United States was entering World War II, where she earned undergraduate degrees in music and English. As a young female college student, Tharp assumed that her career options would be limited to teaching, nursing, or secretarial work. But with so many of the nation’s young men away fighting in the war, Tharp and other women had unexpected opportunities open to them. She was able to participate in an accelerated, graduate-level geology program at the University of Michigan. She received her master’s in geology in 1944 and went on to pick up another bachelor’s degree, this on in mathematics, in 1948. Tharp went to work as a graduate assistant at the Lamont Geological Laboratory at New York’s Columbia University where she met Bruce Heezen, who was then a graduate student in geology. Tharp and Heezen formed a professional partnership that lasted for the next three decades and led them to groundbreaking discoveries. Tharp and Heezen joined a research project that was assigned to map the ocean floor. As a woman, Tharp was not permitted on the research vessels sailing in the ocean. It was up to Heezen to use SONAR to gather data on the topography of the bottom of the ocean, but it was Tharp, working at her desk in New York, that translated the data points into a map. Computers were not available in the 1950s, so Tharp manipulated the raw data by hand. Using only a pencil and a ruler, she drew the topography of the ocean floor along longitude and latitude lines until a complete image appeared. Tharp’s map of the North Atlantic, which was published in 1957, proved that under the ocean waves, the sea floor was not a flat surface. Instead, the water hid impressive natural features much like the ones found above water…mountains, valleys, canyons, gorges, and ridges. A few years later, Tharp’s map of the South Atlantic was published, followed by her map of the Indian Ocean. In 1977, Tharp’s The World Ocean Floor was published, showing the entirety of the world’s sea floors. While working on the North Atlantic ocean floor map, Tharp made a startling discovery. The data from the SONAR pings showed that a long mountain range ran down the center of the Atlantic Ocean. This ridge has become known as the Mid-Atlantic Ridge. In fact, there are mountain ranges that span the entire Earth, called Mid-Ocean Ridges, of MORs…the backbone of the planet. 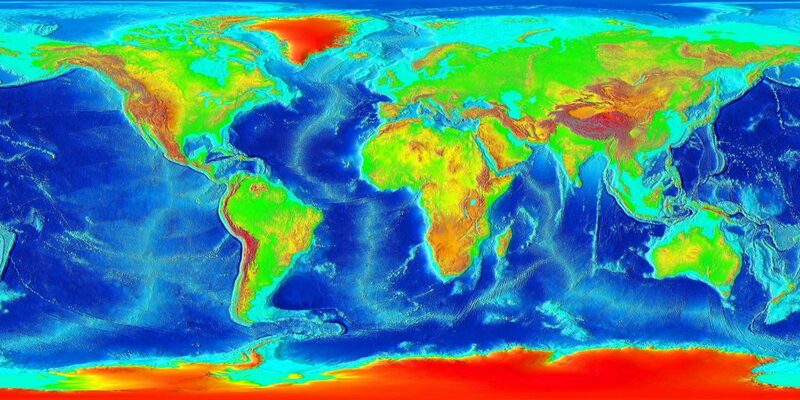 The Mid-Ocean Ridges, as Tharp observed, are caused by magma from deep in the Earth’s mantle that pushes to the surface and splits apart the floor of the ocean. Tharp noted that the spreading center and the fractures on the sea floor were evidence supporting the newly-developed theory of plate tectonics. Plate tectonics was a controversial idea in the 1950s, and one that was not widely held as factual. First proposed decades earlier by German meteorologist, Alfred Wegener, the theory explained the large-scale movement of chunks of land on the surface of the Earth. Plate tectonics helped to validate the idea of continental drift, the notion that the planet’s seven continents once formed one large super-continent billions of years ago, and that this super-continent broke apart and each land mass drifted to its present position. When Tharp showed her findings to her partner, Bruce Heezen, it was not immediately accepted. In fact, he dismissed Tharp’s notions as “girl talk”. Upon further examination of the evidence, however, he agreed that her findings supported the theory of plate tectonics. Together, Tharp and Heezen authored several academic papers on the subject and Heezen even presented their findings at numerous academic conferences. Tharp was content to let Heezen speak publically about her findings. Of course, it generated much debate in the scientific community and Tharp preferred to stay out of the debates. Instead, she focused on making more maps of the world’s sea floors. 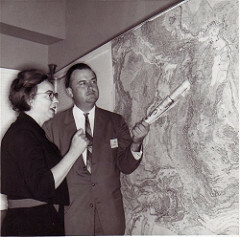 Tharp was eventually given the credit that was due to her for discovering and mapping the MORs and adding evidence to the theory of plate tectonics. In 1996, Marie Tharp was awarded an Outstanding Achievement Award from the Society of Women Geographers. The following year, the Phillips Society of the Library of Congress named her as one of the Twentieth Century’s Outstanding Cartographers. In 2001, she was presented the first Lamont-Doherty Heritage Award. Tharp died of cancer in 2006 so she wasn’t able to see her work included in Google Earth in 2009. The Marie Tharp Historical Map layer was a way for people to see Tharp’s ocean floor maps on Google Earth. Tharp’s contributions to physical geography cannot be understated. It is especially impressive that Tharp did her groundbreaking work at a time when female scientists did not get the respect they deserved. Tharp’s alma mater, Columbia University, established the Marie Tharp Fellowship, a highly competitive visiting fellowship for female researchers at the university’s Earth Institute, as a way to honor Tharp’s achievements and to help the next generation of women in science. Blakemore, Erin “Seeing is Believing: How Marie Tharp Changed Geology Forever.” Smithsonian Institution. 30 Aug. 2016. Web. 10 Sept. 2018. Bressan, David. “Marie Tharp, The Woman Who Discovered The Backbone of Earth.” Forbes Magazine. 30 July 2018. Web. 10 Sept. 2018.